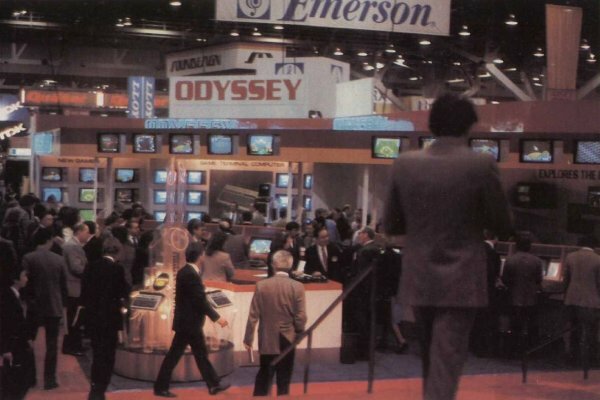 Si è da poco chiuso il Consumer Electronics Show del gennaio 2019, con le sue innumerevoli proposte relative alla telefonia, al 5G, ai televisori extra-large e alla robotica: facendo un salto indietro nel tempo di 36 anni, in questa nuovo capitolo delle Iconografie, veniamo catapultati in un mondo tecnologico completamente diverso e, se vogliamo, più affine ai temi di questo sito. 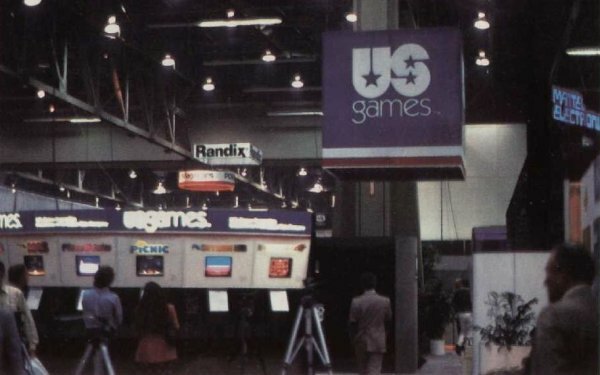 Il Winter CES di Las Vegas (5-9 gennaio 1983) si situa in un momento particolare della storia del videogioco e, a posteriori, è diventato un po' lo spartiacque tra il momento di massimo successo delle console made in USA e quello della loro estrema crisi, principalmente a causa del crollo di Atari. 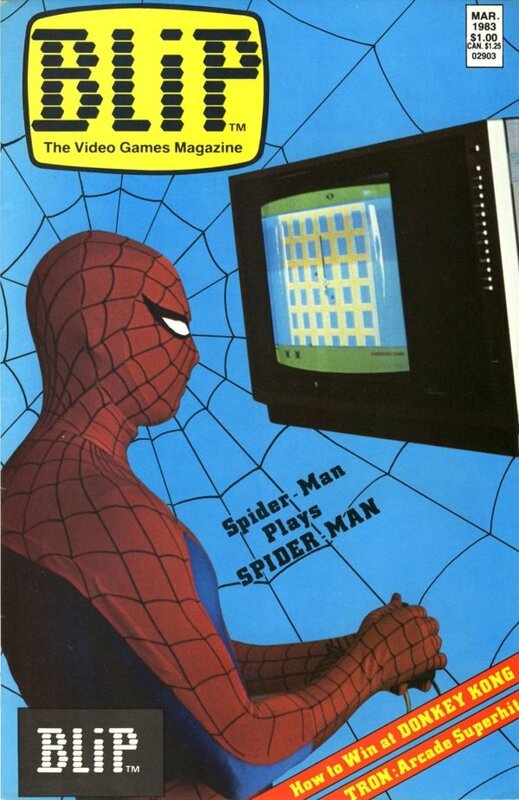 Dal punto di vista dei media cartacei, se nel 1981 una sola rivista americana era esclusivamente dedicata a questo argomento (Electronic Games della Reese Publishing), nel 1982 diventarono ben cinque: si aggiunsero Video Games (agosto); Videogaming Illustrated (agosto); Video Games Player (autunno); Electronic Fun (novembre). 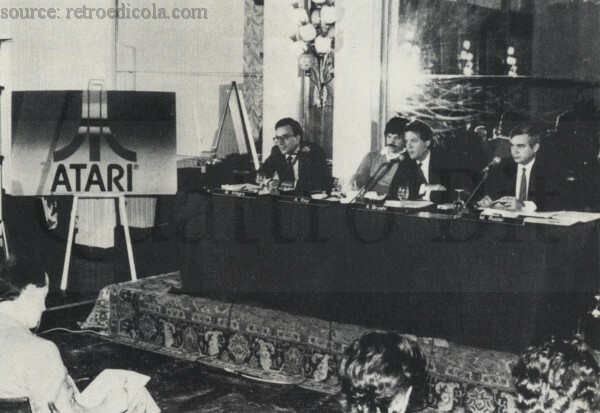 Tutte chiusero tra il 1984 e il 1985, cioè nel momento in cui il mercato si spostò verso i computer games, attendendo l'imminente invasione giapponese della Nintendo. 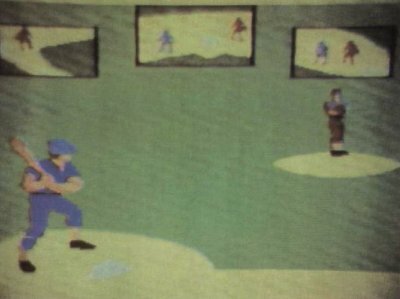 Questo bel reportage in 33 scatti (a cura di Perry Greenberg) è tratto da una delle riviste appena citate, Video Games della Pumpkin Press, precisamente il n. 7 dell'aprile 1983; per ogni fotografia è conservata la didascalia in inglese. Le scansioni originali sono state realizzate da Scott Stilphen. In fondo accludiamo un addendum video, cioè un servizio televisivo relativo al Winter CES, tratto dal programma Entertainment Tonight della CBS. 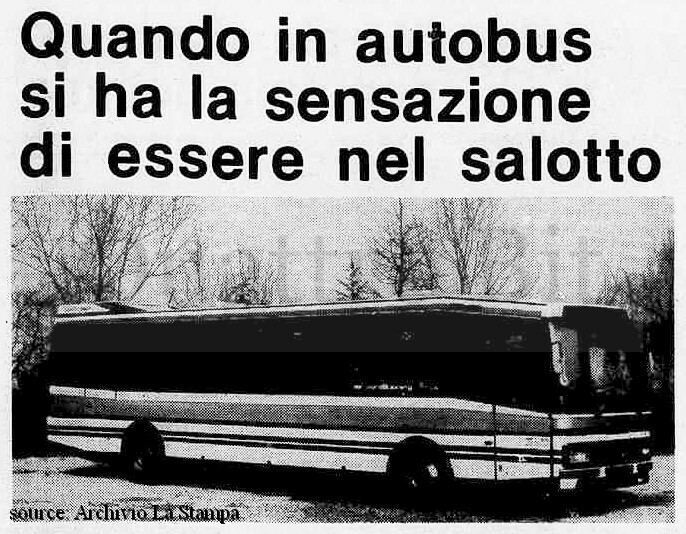 Buona visione. 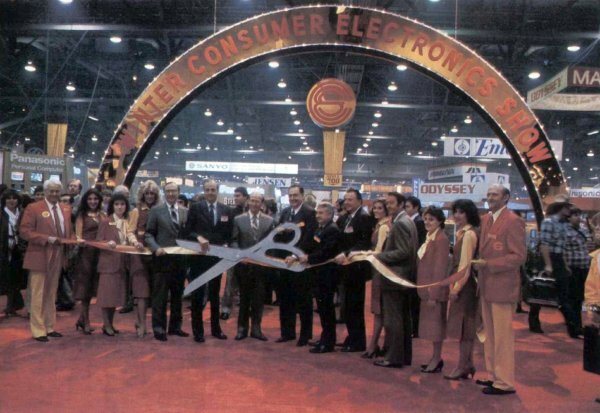 A group of state and city officials, including Nevada governor Richard Bryan and Las Vegas mayor William H. Briare, wield a pair of oversized scissors for the ribbon-cutting ceremony. 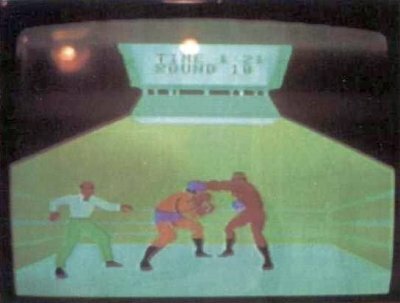 A scene from Rocky Battles the Champ, soon to be a video game from Coleco. 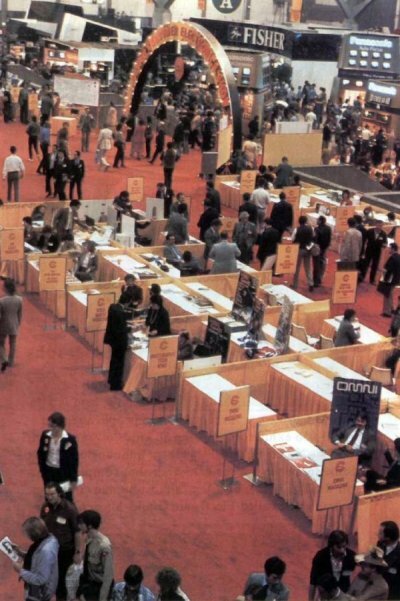 An overview of Las Vegas cavernous Convention Center. In the foreground is Magazine Row, where trade and consumer publications set up shop. What's a publisher to do? VG's Cheh Low blushes as he receives busses from our favorite foursome. 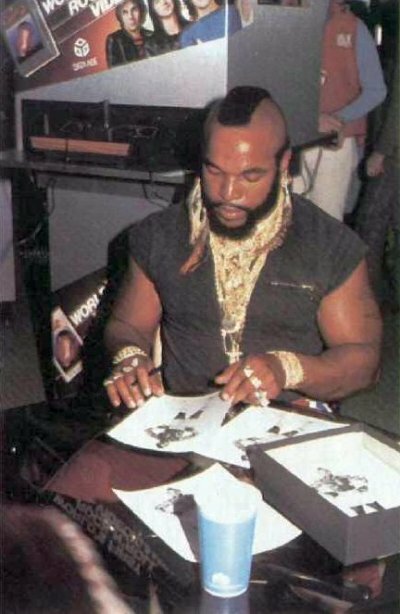 Mr. T, who'll be turned into a video game by Data Age, signs autographs for his fans. Rocky who? 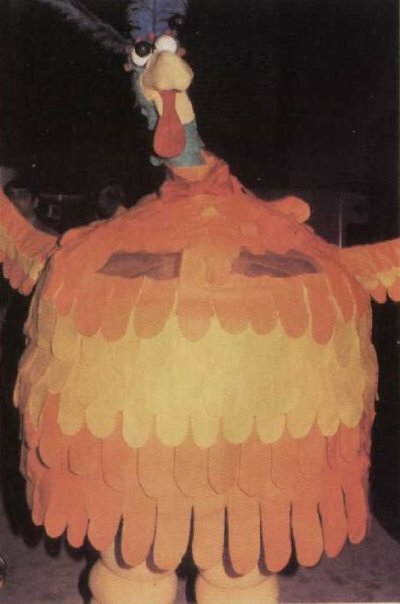 Weird Bird, who left a trail of green eggs wherever he went, was there to tout U.S. Games' Eggomania. 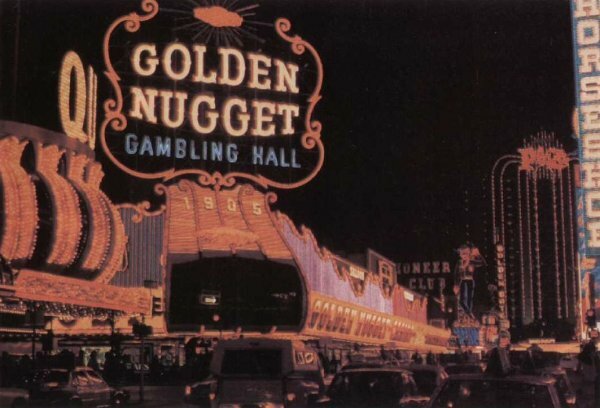 Downtown Vegas at night: A neon haven where just about anything (usually your money) goes. 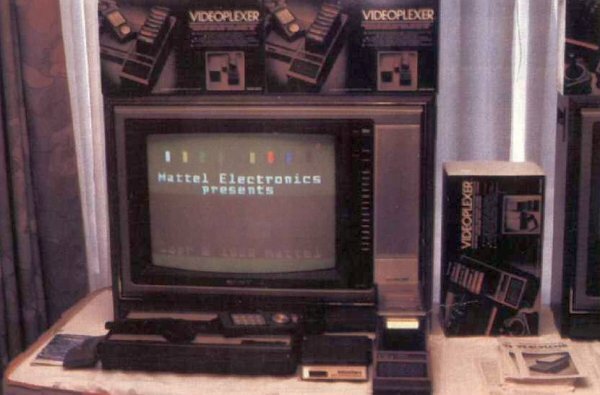 Plug eight carts into your VCS or Intellivision at once, thanks to Compro Electronics' Videoplexer ($59.95). For gamers who like to think BIG, try playing on a Digital Technologies' projection TV. 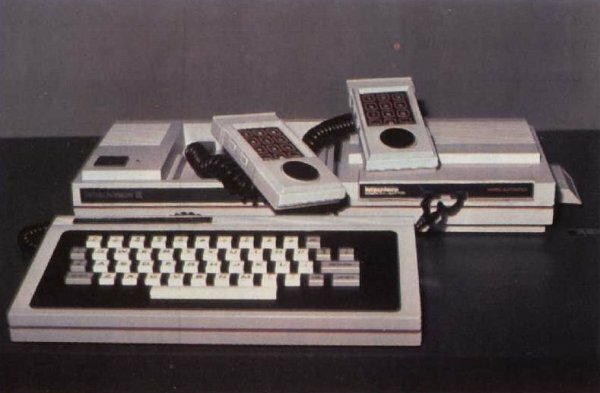 Mattel introduced Intellivision II, a more compact Intellivision that features detachable hand controllers. 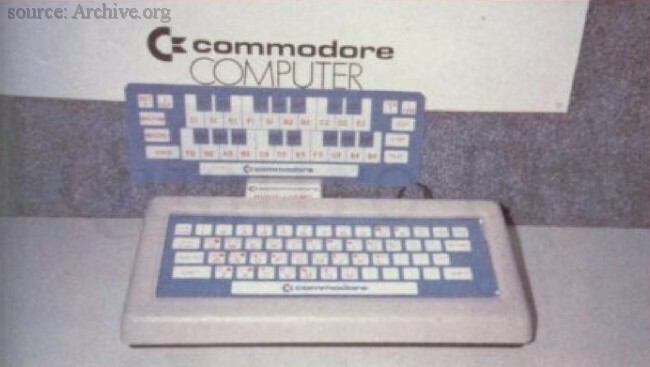 Here it is shown whit Computer Adapter (2 K RAM, 12 K ROM) and 49-key keyboard. Estimated total price: $300. 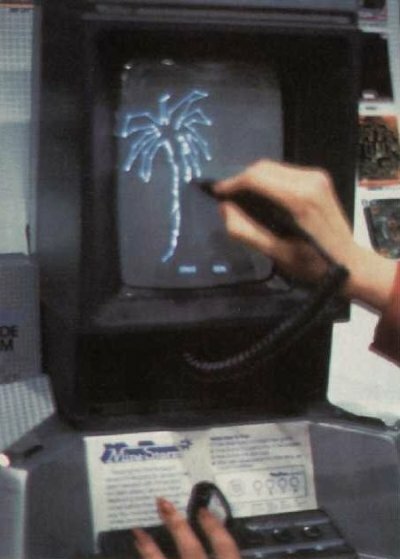 GCE's light pen for its Vectrex system lets you to draw on screen. 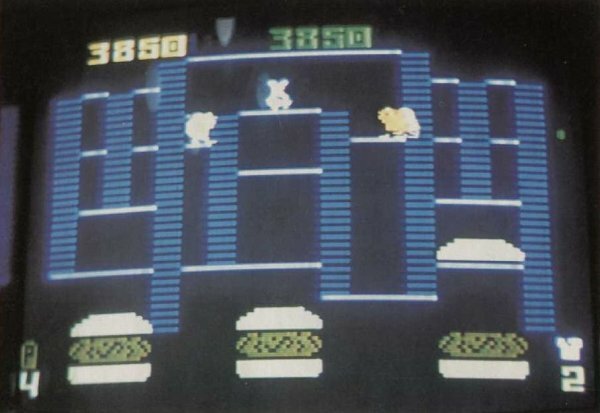 VG's pick-hit game of the show: Burger Time. 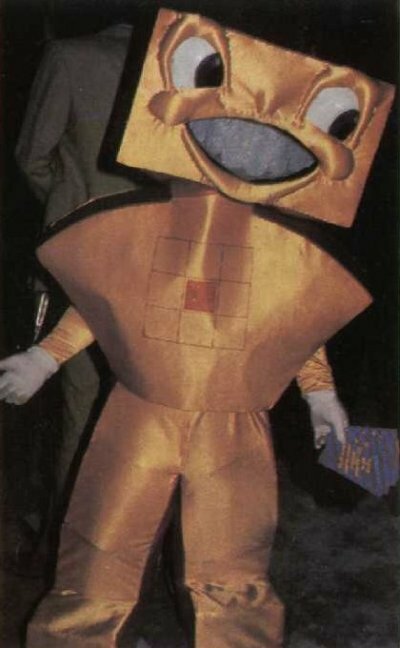 By Mattel for Intellivision. An M Network cart will also be available. 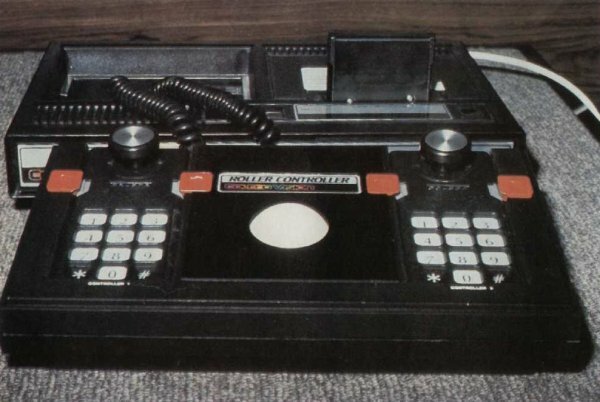 Let 'er roll with Coleco's Roller Controller. When it arrives this year, a Slither cartridge will accompany it. This Tronix tot stopped by to promote the company's Kid Grid game. A Penthouse Pet gives our fearless photographer the eye. 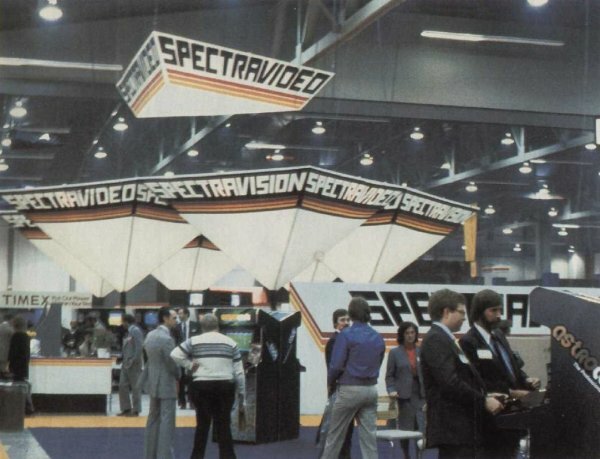 Spectravision needed plenty of space to display its latest products. 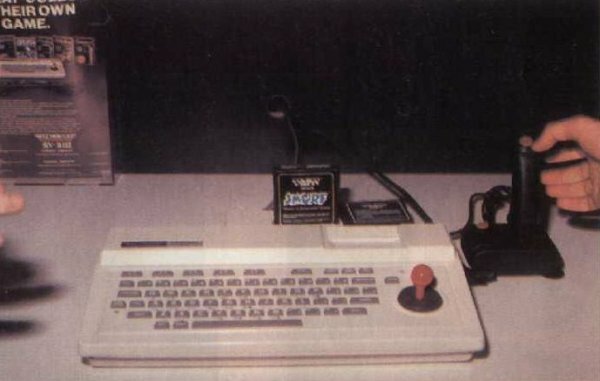 Those included: the SV-318 computer; a line of 14 peripherals and over 100 programs; software for the Timex 1000; the CompuMate add-on keyboard for the VCS ($100); three new VCS games; and Vortex, a 3-D game for several systems that comes with 3-D glasses. 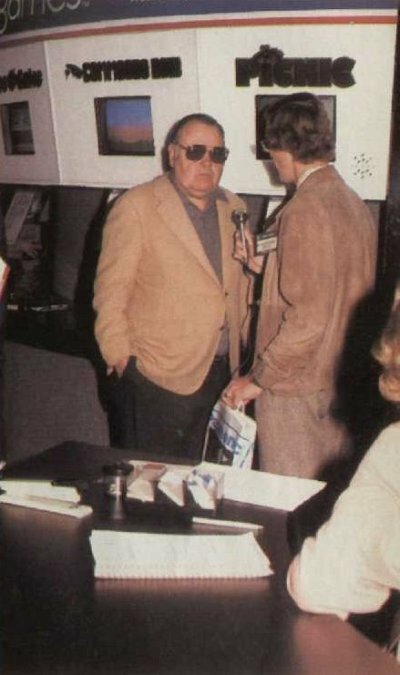 Name This Celebrity spokesman and U.S. Games will send you a free autographed photo. Vvrrrooom! Screee-eech! 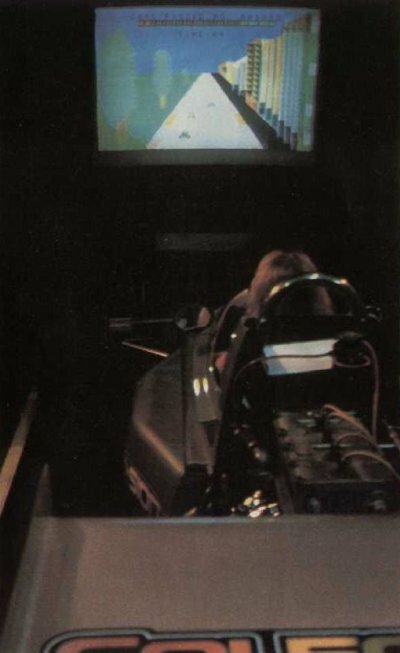 Coleco's Turbo set-up literally puts you in the driver's seat. The VG gals with Associate Editor Perry Greenberg. Hey, who took this picture, anyway? 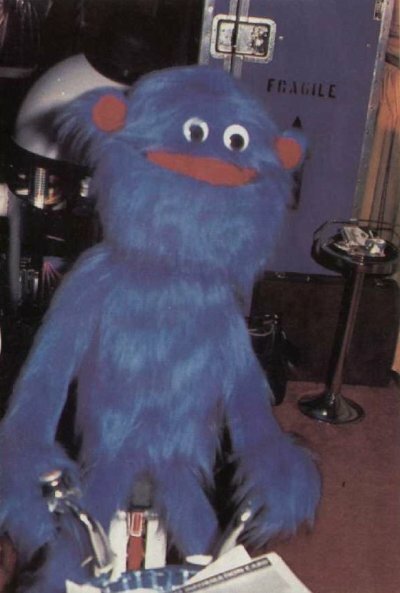 Who this fuzzy critter is nobody here seems to remember. But we thought he was too cute to keep to ourselves. 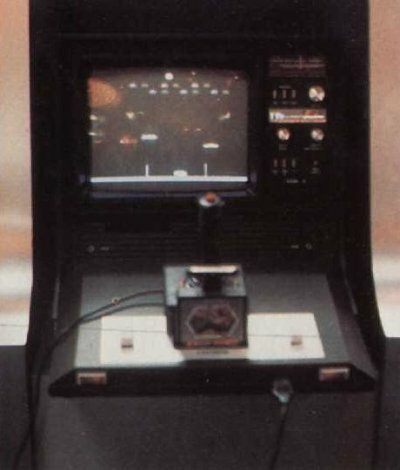 Coleco's Super Action Controller actually allows you to "feel" the action when you play the new line of games. As with the Driving Module, one game - Contact Baseball - will come with the controller. Contact Football is scheduled to follow. One of the many adapter modules at the show was this ColecoVision expander ($70). The computer, Spectravideo's SV-318, by the way, has 32 K ROM and RAM and 71 keys. Odyssey's well-travelled booth displayed many new items, including the new Command Control system. Those well-groomed guys are Bob Gardner (l) and Jay Boda (r), our advertising manager and director, respectively. What a life! Name this Company! 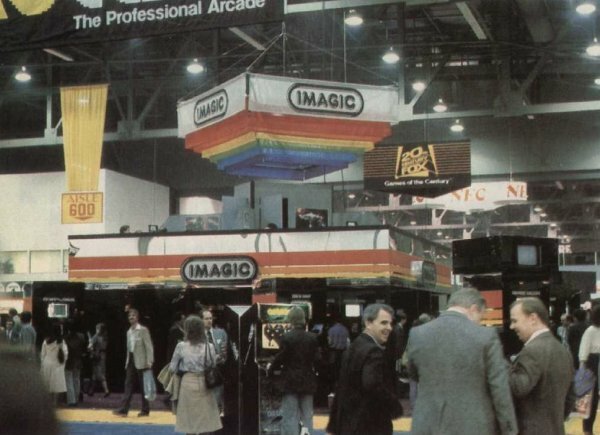 U.S. Games had plenty to show and announce at CES, including its Name This Game promo, and such upcoming games as Pink Panther, M.A.D. (Missile Attack and Defense), Gopher, Piece O' Cake and Eggomania. Twentieth Century-Fox's outpost, The Swamp, was the S*M*A*S*H* of the show. 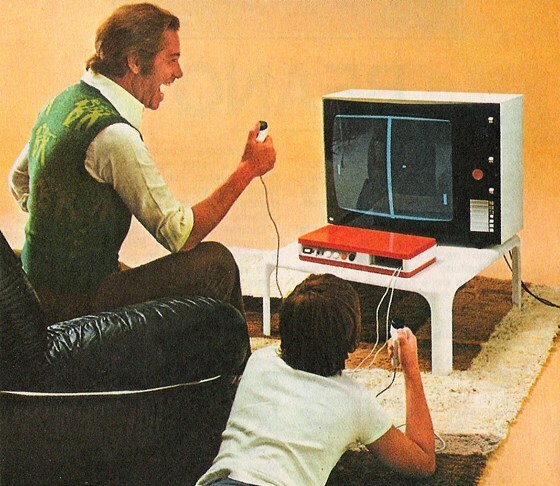 To play this exciting baseball game on Intellivision, you need Mattel's Computer Adapter and Keyboard. If you're not into baseball, you can always turn to BASIC. VG's leggy lovelies take a break by the booth. 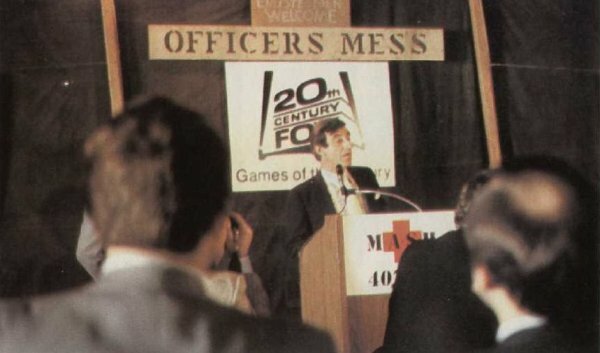 Jamie (Corporal Klinger) Farr announces 20th Century-Fox's M*A*S*H game at a press conference. 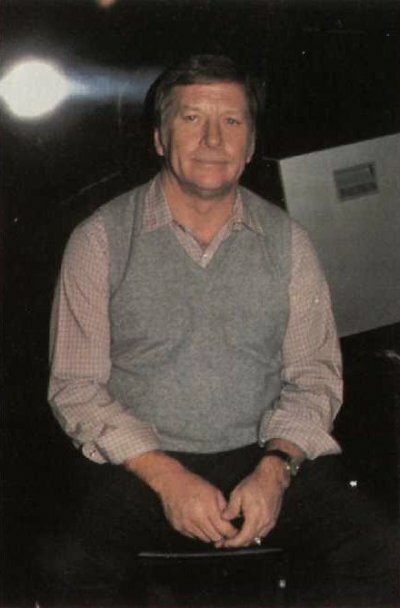 (photo by Anne Krueger). 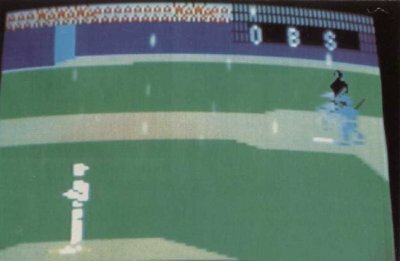 ColecoVision's new baseball game not only provides superior graphics but also multi-screen visuals. The video game companies were just a hop, skip and a jump away from one another. 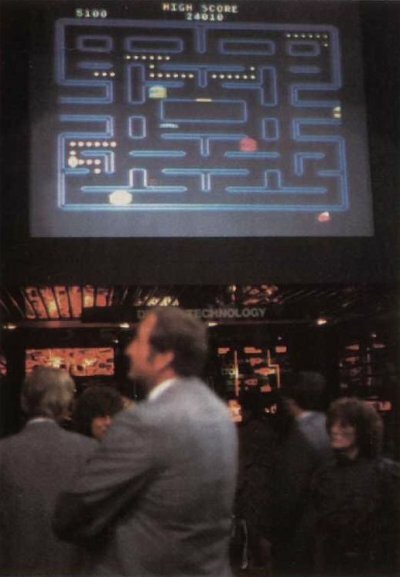 At Imagic, the horde tested out its new line of computer games, which included Demon Attack for the Atari 400/800 and VIC-20. Mickey Mantle was on hand to help publicize Coleco's 3-D baseball game.